Six images showing the host galaxy of the newly discovered supernova ASASSN-18bt. The top row shows three images from before the explosion taken by Pan-STARRS, ASAS-SN, and Kepler. The bottom row shows images from ASAS-SN and Kepler after the supernova was visible. The discovery image from the ASAS-SN team is in the bottom middle. To its left is a version with all the surrounding stars eliminated, showing only the new supernova's light output. On the bottom right is a Kepler image from after the supernova was detected. Kepler's precision was crucial to understanding the light from ASASSN_18bt in the early hours after the explosion. A supernova discovered by an international group of astronomers including Carnegie's Tom Holoien and Maria Drout, and led by University of Hawaii's Ben Shappee, provides an unprecedented look at the first moments of a violent stellar explosion. The light from the explosion's first hours showed an unexpected pattern, which Carnegie's Anthony Piro analyzed to reveal that the genesis of these phenomena is even more mysterious than previously thought. Their findings are published in a trio of papers in The Astrophysical Journal and The Astrophysical Journal Letters. Type Ia supernovae are fundamental to our understanding of the cosmos. Their nuclear furnaces are crucial for generating many of the elements around us, and they are used as cosmic rulers to measure distances across the universe. Despite their importance, the actual mechanism that triggers a Type Ia supernova explosion has remained elusive for decades. That's why catching them in the act is crucial. Astronomers have long tried to get detailed data at the initial moments of these explosions, with the hope of figuring out how these phenomena are triggered. This finally happened in February of this year with the discovery of a Type Ia supernova called ASASSN-18bt (also known as SN 2018oh). ASASSN-18bt was discovered by the All-Sky Automated Survey for Supernovae (ASAS-SN), an international network of telescopes headquartered at the Ohio State University that routinely scans the sky for supernovae and other cosmic explosions. NASA's Kepler space telescope was simultaneously able to take complementary data of this event. Kepler was designed to be incredibly sensitive to small changes in light for its mission of detecting extrasolar planets, so it was able to obtain especially detailed information about the explosion's genesis. 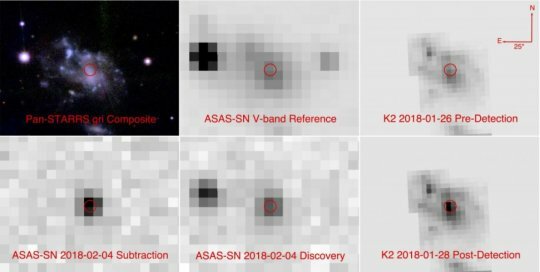 "ASASSN-18bt is the nearest and brightest supernova yet observed by Kepler, so it offered an excellent opportunity to test the predominant theories of supernova formation," said Shappee, who is lead author on the on the discovery and early time light curve paperand one of our Carnegie alumni. Combining data from ASAS-SN, Kepler, and telescopes around the world, the astronomers realized that ASASSN-18bt looked unusual during its first couple of days. "Many supernovae show a gradual increase in the light they put out," said Drout, who is jointly appointed at the University of Toronto. "But for this event, you could clearly see there's something unusual and exciting happening in the early times -- an unexpected additional emission." Type Ia supernovae originate from the thermonuclear explosion of a white dwarf star -- the dead core left over by a Sun-like star after it exhausts its nuclear fuel. Material must be added to the white dwarf from a companion star to trigger the explosion, but the nature of the companion star and how the fuel is transferred has long been debated. One possibility is that this additional light seen during the supernova's early times could be from the exploding white dwarf colliding with the companion star. Although this was the initial hypothesis, detailed comparisons with Piro's theoretical modeling work demonstrated that this additional light may have a different, unexplained origin. "While the steep increase in ASASSN-18bt's early brightness could indicate that the explosion collides with another star, our follow-up data don't fit predictions for how this should look," Holoien said. "Other possibilities, such as an unusual distribution of radioactive material in the exploded star, are a better explanation for what we saw. More observations of ASASSN-18bt and more early discoveries like this one will hopefully help us differentiate between different models and better understand the origins of these explosions."